Now, I'm not here to start a debate. Really. I just want to point out a few things about both and see what every one else thinks. Let's get to talking books! It's not a secret that I love my Kindle. I actually went into meltdown mode when my screen froze last month and Amazon actually had to send me a new kindle. I love it. I think it is THE. BEST. INVENTION. EVER. I have enjoyed it much more than I ever thought that I would. I used my kindle app on my iPod so much that is when I decided to buy the real thing. That's when my love affair with my kindle started. I can download a book in 60 secs. I don't have a book store here in my town in Scotland. Makes it a trek to go and get a book. Even if I order one online, I still need to pay for shipping and wait for the book to arrive. I'm not to keen on waiting. I love how accessible books have become for me since having my Kindle. I read faster on my Kindle. I do. I don't know what it is. Maybe it's the lack of having to flip a page. It is easier to read in bed too. It is easy to hold. I now find paperbacks quite awkward to hold. Is that weird? There are so many good deals on Kindle. I have a ton of free books. I don't see Waterstone's handing out free books. There are a ton of books at whatever price point you're looking for. I also love that I can keep checking back for my favorite books and when I find them on sale, I grab it! I love the price of books on my Kindle. It is so much easier to carry around! When traveling I use to bring 4-5 books for a week and wonder if that would be enough. It took up a ton of space. Now I can carry as many books as I want with me, where ever. I take it with me everywhere. I just throw it in the diaper bag and when I get a min I can pull it out! You don't need a Kindle to enjoy Kindle books! Download one of the apps to read on your phone, iPod, or PC/Mac! I love instant gratification. You can enjoy it too, without buying a Kindle! Covers. I love books covers. I love looking at them on the shelf. I totally judge a book by it's cover and it is usually what gets me to buy a book. Easily read book jacket. I have to log on to my wifi on my kindle just to read the book description. Sometimes I can't remember what a certain books is about that I bought and I want to check the jacket. I love that about traditional books. Book stores!!! I have always loved walking into a book store and letting the books call to me. They choose me, not the other way around. I like being in the midst of other readers. My kind of people. It is sad so many book shops are closing. We need to do our part to keep them open!! Keep buying books from your local indie or local book store. I love sharing and borrowing books. It feels good to share a book with a friend or loved one. Hand something to them that you've loved and want to share with them. Here in the UK we still can't share our kindle books. Yet. All that being said... I prefer to read on my Kindle. I do. Does that make me a traitor? I don't think so. I'm reading more than ever and buying more books than ever before. The Kindle has made me into an even more lover of reading! But, I would never ever want to get rid of traditional books all together. I feel it is important for our future to buy and read traditional books. It is important for publisher's, authors, libraries, and readers. I think those of us who use an e-reader need to make sure to buy traditional books each year as well as e-books. I believe it would be a sad world without them. Plus my bookshelf would look like of funny. 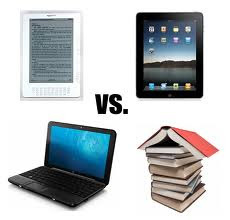 So, let's get chatting about books vs e-readers. What do you like about each? Are there any of you against e-readers all together? Anybody want an e-reader but don't have one yet? Anyone have an e-reader and love or hate it? Give it to me! Let's chat! E-books - reading books on the go and having them occupy less space. Paperbacks - covering them in plastic and lining them up to look pretty on my shelf. @gwacie I have a small flat, so the space thing is HUGE for me. I like being able to keep so many books in such a tiny space. But, I do love my bookshelf! It is nice to see colorful books and remember the stories inside them each time I look at them. I love my Kindle too. I agree with you about it being easier to read in bed, about the great offers and the immediate arrival of a book. I also wholeheartedly agree about using it for travel! Probably the thing I love most is the way I have an app on my phone, so if I find myself unexpectedly in a long queue, I can just pull out my phone and read. I love the way it syncs with what I'm reading at home. It's brilliant! Anyway, I definitely buy plenty of both sorts of books! @Luisa You're right. I have read some gems of self-published books. They are just harder to find for me! Picture books and my son's baby books just wouldn't be the same electronic. He likes to put them in his mouth when he's done reading. There are benefits to both I think. I have been e-reading mostly exclusively for the last year or so (with moving twice it is just easier to not build up a big library, and I had stored or donated most of my old books), but sometimes I miss a good old book. And on planes, it is sort of a bummer to not be able to read right when you sit down and through take off and landing. With an e-reader you always have to turn it off. I think I am going to continue doing both, that's for sure. And I agree with what you said above, Mary, kids books just need to be board books. Wouldn't work for them to put a kindle or Iphone or Ipad in their mouth or (like my son does) throw it around! I'm about to buy my first e-reader, a Kindle but I don't think I will be able to give up buying beautiful books. Do you think books will be more like souvenirs of a great Kindle read? @Ally You are going to LOVE your Kindle! I had no idea I would like it as much as I do. I think I'm worried that with all the e-books that someday traditional paper books will be obsolete. Someone should write a dystopian novel about that. It is sad to think, and that's why I think if we own an e-reader it is still our responsibility to buy and borrow traditional books. I think my Kindle is an extension of a great book. I LOVE IT! I like both. I love buying romance novels on my kindle and also the cheaper on-sale books.But books that are very special to me, I like to have a hard copy of. @April If it is a favorite book I HAVE to have a hard copy of it! I will usually buy a kindle copy and a hard copy. @Sara Lyn To me, the Kindle doesn't look like a screen. It looks exactly like a paperback page. It is made with anti-glare materials, and there is actually ink inside! You'd be surprised how much like a book it actually IS. I live in the country so my choices for bookstores are a 45 minute drive away and are much expensive than Amazon.com The selection at my local walmart, target and library can be quite limited although they are getting better. I love my Kindle I love the free books, I love that I don't have to worry about storage and like you I find I read more when I have my kindle, maybe its because I have the kindle ap on my phone so I can read even if I have left the device at home. It makes sharing what I read easier too because I can highlight things, and link to books on my facebook page. I love it! When I moved across the country, it was easier to carry my Kindle than move with all my books (plus I was on an internship so it's not like I had a lot of room to store books)! And I agree that it's MUCH easier to read in bed with your Kindle than with an actual book! While I still do love my hardcover and paperback and book covers... I much prefer my Kindle. I feel so wrong saying that, but it's true! I love finding other Kindle lovers!!! @Dead Trees and Silver Screens I'm the same way. The closest book store is 30 minutes away, on a good day and my local grocery stores book selection leaves much to be desired. It is just easier/cheaper to have a Kindle. @Marie I totally prefer my Kindle! I actually find holding a paperback a little weird now. Is that strange? My Mom tells everyone the best feature is how easy it is to read in bed! It totally is! I'm all about the cheap and free books! I don't see my local book store giving out free books. I just got a Kindle Touch over the weekend but I already love the ease of reading on it and the quick download time. However, it may someday take over as my favorite over real books but right now I still love real books and plan on buying them still as well as e-books. @Rachel Oh, I'd love to try the Kindle Touch! I really do enjoy reading on my Kindle. It is actually fun. Just using the device is fun. Not to mention the book I'm reading! It is such a convenience for me. I love it. You know what? Now that you mention it I think I read faster on my Kindle too! And yes, it's definitely easier to hold onto in bed. Great post! I received a Kindle for christmas and I love it, the e-ink is amazing. I like to use my Kindle for older titles and indie novels. I like how everything is synced and it's so compact that I always have it with me. However, I can't imagine giving up physical books. I want to have a huge bookshelf ! Not to mention for a penny-pincher like me, I can surf used bookstore for deals on new releases. Everyone has some great insights. ! @Midnyte Reader Ease of reading in bed is my Mom's #1 reason she loves her Kindle. Isn't it funny? I don't need to flip from side to side or hold the pages back. It's just easy! I KNOW I read faster on my Kindle. I don't know what it is, maybe it's that little page clicker? I can just zoom right through! Thanks fr joining the discussion! I never in a million years thought I would be a fan of e-readers, but I bought one when the only convenient bookstore around me closed last February and now I LOVE my Kindle more than anything! Seriously, it's the best "toy" ever for any book lover. I ride the train to work and when it's crowded, I have to stand. It is a million times easier to read with my lightweight Kindle than trying to juggle a paper book which requires two hands to read. The Kindle has also helped me spend my money more wisely on books. I still go for the more expensive titles (because most of the books I want to read are published by the big publishing companies that set their own prices, as opposed to the self-published or indie books), but instead of stocking up on books like a squirrel stocks up for wintertime, I just download samples to remind myself that I want to read certain books and then just buy the book when I'm actually ready to read it. The fact that you can get the book instantly removes the necessity of buying books to "save for later." If a book I want to read is on sale, though, then I'll just buy it right away because the sales sometimes don't last long. I still love having actual books on my shelf, but one of my resolutions this year is to try to stop buying additional paper books and switch to buying new Kindle books only. This is because I will be moving in a few months, and moving a Kindle with all of my books on it is so much easier than packing hundreds of heavy books. However, if a book turns out to be a favorite, then I will allow myself to buy a hardcover copy for my shelf. I still have so many unread paper copy books on my shelves (more than 300), but sometimes I will also buy the Kindle version of whatever I'm reading from my shelf to read when I'm out and about and then just read the paper version when I'm back in my apartment. This helps me get through my TBR books much faster, but I'm curious if I'm crazy to double-buy books? Perhaps, but my justification for it is that I'm making an effort to get rid of all read books that aren't favorites, so having a copy of the book on my Kindle makes it easier for me to give away my paper copy once I finish it. @Sarah I think you're my kindred spirit in all things Kindle! I could talk forever about my Kindle! I never thought I would love it as much as I do. When people tell me they can't get over reading on a screen, I ask them if they have a kindle or ever borrowed one? The answer is always NO. It looks just like a paperback page doesn't it?! I have a small flat in Scotland, and I seriously just don't have the room for books anymore. I wish I did. Someday I'd like to have a library but now is not that time. Not to mention traveling is so much easier with a Kindle. Boom, I've got hundreds of books with me in my hand. Whatever I'm in the mood for. Love it!! I love the deals too. I put books I want on my wish list and check back often to see if any are on sale. I can't do that with a book store. I love the samples as well. I like to see if the book catches me in the first few chapters. You should write your own Kindle post!! I love both...the only real downside is I love to read in the bath and well waters not that compatible with Kindle! @Vicki I SO agree about the bath! It is nice to have a paperback on hand for such an occasion. Girl, it sounds like I wrote this post myself! And it most certainly doesn't take 60 seconds for my books to download! I seem to have them in a mere 10 seconds after turning on my wi-fi! I too read faster on the Kindle. I have no idea why either, except maybe because it's just so comfortable to hold and faster page changing with a push of a button. I had a running spreadsheet to compare how much money I saved buying Kindle editions versus print the first year I owned my first Kindle. It paid for it's self! I LOVE this typo: Barrons, Books and Baubles. It should have been "Barrons Books and Baubles" but I'll take a Barrons, Books and Baubles store anytime. ;) Oh, how the misplacement of one comma can excite a girl. @Jess AH!! OK, I seriously laughed so hard at the name of your dream book store. Punctuation makes all the difference! I am so freaking in love with my kindle. I actually get upset when people say they like the smell of a book or they can't get use to reading off a screen. This means they haven't ever tried it. I'm positive, because it looks so much like a paperback page it is unreal. I am convinced they say things like that to seem some studious. My Kindle rocks my socks off! 10 secs is about what mine downloads too, 60 secs is what Amazon advertises, but I just LOVE instant gratification!!!! GIVE IT TO ME NOW! I can't tell you how many times I've been dying for a book and had to wait until I could get to the book store to buy it. Or wait for it to come in the mail. With my Kindle, pre-order and BAM! It's there at midnight on release day! AMEN! I've been laying in bed and searching for a good book, found one, downloaded it, and began reading all from my bed. What's not to like about that?! I am SO in love with my Kindle. Best. Invention. Ever. I think the pro's far outweigh the cons! I love seeing the pretty covers on my shelves, but realistically I read wayyyy tooo much to read only print copies. I have 6 bookshelves... Tall ones with 5 shelves each and they are basically full. I've got over 150 books on my Nook and 30 something on my Kindle. I don't know WHAT I would do without my e-readers. They've totally changed my reading experience. There are pros to both I think. But I have to say I'm a traditional book girl. I like to have a Kindle - for the odd book/convenience and for instant downloads - they are addictive. I like my Kindle for free books, very cheap books and NetGalley but I'd never buy anything that cost more than £3 on it. If Im paying the same amount then I want the hardcopy! Reading on the Kindle is so clinical - part of the pleasure of reading for me, is to feel the paper and smell the pages as I read. I hate not being able to flick through to your favourite part of a book. Kindle has also lost my page a few times now and it took forever to get back to where I was cue one very irritated girl! Book cover designs and illustrations are a big thing for me - and I love my bookshelves - a room feels empty without books. If I read a book on kindle that I really like I have buy a proper copy of it. I can't stand the thought of one day having all your books invisible on one little device! I read slightly quicker on the Kindle, but I also find books forgettable on there as well. Out of sight out of mind as they say! Kindle are great for reading trashing bodice rippers in public without anyone knowing lol! I actually don't find it easier to hold! Strange - but it gives me hand cramps and I find the page forward buttons are in an awkward position. @Tara I think there should be a disclosure on self-published books. Ugh. No offence, well maybe offence, but there are just too many traditional pub books I want to read to mess with unpolished, unedited books. @Amy Good to see the other side of the coin! You've got an e-reader but you prefer traditional. That's nice to see! It will be people like you who keep real books on the shelves!! I can say that the suspense of the end of a book is more thrilling to me with a physical book in hand. Knowing there are only a handful of page turns is a nice thing but a page turn on the Kindle is hit or miss when gauging when a book is actually going to end because there's no "real" measurement to judge it on. Percentages are hard to break down into page clicks. I do miss seeing page numbers. Great post!! I am always back and forth on this, one day I want it, the next day I don't. It's kind of frustrating and reading this post and the comments have been really helpful. I'm interested in getting an e-reader myself, but I'm not sure if i should go with a kindle or a nook... Any advice? I felt like a traitor when I bought my e-reader (an Archos 70b). I always said that I would never ever ever buy one, but I must admit it: I'm crazy in love with it. I also read faster on my e-reader. It's so weird and I can't explain why, but you're right. Perhaps it's because I don't really know how far I am. When you're reading a book, you can see how many pages you have to read and on my e-reader, I just reach the end without noticing it. I'm not going to say that I love it more than a traditional book. I can never say that. There's nothing better than having a hugh book collection. Staring at the covers. Touching different books before choosing which one I'm going to read. But I'm also not going to say that I love a traditional book more than a e-reader, because I take him with me every where I go. It's so much easier. I don't have to take two books with me when I'm almost done with one. Now, I have hundreds of books on one little device. So much easier when I'm going on vacation. I know this is an old discussion but I wanted to comment on it. I too am a kindle owner & I love it! I've had it for about a year now and have almost 800 books on it. I love buying kindle books because it's quick & easy. There are also plenty of free books to get everyday as well. The only downside to the kindle for me is the prices. Lately I've discovered the clearance section at Books A Million. They have a ton of great books for $3.97 each. After discovering that I can't seem to justify paying $10 or sometimes more for the same book on kindle. Of course Amazon always has used versions of books for sale too from sellers. Sometimes less than the kindle version even with shipping costs. Then the debate becomes "pay $10 for a book & get it immediately, even if I'm not going to read it right away. Or save $3+ and wait for it to be shipped. I usually go with the cheaper book. So I think for the most part I'll be using my kindle just for the free & 99 cent books I get and books authors ask me to review. I'll stick to physical books for just about everything else. But as I say "It's not how you read, just as long as you do." I have a nook tablet which displays the covers in high-def gooey goodness and i find it easier to hold, i no longer worry about bending a spine, or wrinkling a page or crying on it...hehehe. I knew i was addicted to my e-reader when i was reading an arc from a publisher and tried to read with the lights off..WTH no backlight??? course..i still have books on my shelf..but this year i have bought only eBooks. fyi.its also a wonderful way to hide your book addiction! Hahahahahahaha!!!! I love that you tried to read with the light off. Ha! Good one. I seriously prefer my Kindle. It's just fun! Every time I read it is like using my Kindle for the 1st time. I fought the kindle for a long time... I love the feel of a real book, exp the large paperback style. I can spend hours parusing bookstores, esp used and small mom and pop style. I love the smell and feel of previously loved book. I love the look of books stacked in bookshelves floor to ceiling. It is so convenient and I can download at 1am when I am jonesing for the next in a series. MY FIX! I have limited space to store and find it hard to release any of my yummies. I am a book hoarder (except for a few donated to my local library). One huge pro is... as much as I love the covers.. some of them are not child appropriate. The kindle solves that nicely. I loathe the large paperback style! They are so uncomfortable to hold!!! I do miss book stores. We don't have one in my town anymore and is the main reason I purchased my Kindle. I love having ALL books in one spot online, but I just really love bookstores and letting books come to me. That is something I miss. LOVE being able to hide my covers. Hahahhahaha!! I love both, and I find I swap back and forth. I'll read on my eReader (and I have an iPad and a Kindle - so I switch on those too *lol*) then after 2 books or so? I'll grab a paper book. Just for the feel. I find that I read more when I switch mediums, oddly!! If I stick to just one for too long? I slow down in my reading volume by huge amounts. I do that too. I will read a batch of paperbacks and then a batch on my Kindle. Makes it easier because I have to get used to reading a physical book all over. I'd rather do then in batches while I'm "used" to them. I love me some older books. Not everything I review has to be new and up and coming. I'll read whatever I want whenever. Got to love the library! !